Knob-heavy pedal offers compression, limiting, tape saturation and more. 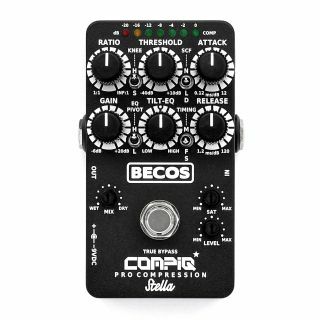 Romanian pedal maker BecosFX has introduced the CompIQ PRO Stella Compressor pedal for guitar and bass. The new stompbox provides compression and limiting with a twist of available harmonic distortion. CompIQ PRO controls compression through six parameters: Ratio, Threshold, Attack, Release, Tone and Make-up Gain. Four switches provide options for Compression Knee (Soft/Hard), Side Chain Filter (Normal / Low / Deep), Timing (Manual / Auto Fast / Auto Slower) and Tilt-EQ Frequency Pivot (330Hz / 1KHz). The pedal also features an Auto Timing circuit that responds to playing dynamics and a Dry / Wet blend knob for parallel compression. Additionally, there’s tape saturation analog circuitry with independent Saturation and Level controls, and additional Lo / Hi-Cut filters for the tape saturation effect. Other features include six-LED accurate compression display and true bypass on/off foot switch. The CompIQ PRO Stella Compressor is available for $279. For more information or to purchase, head over to BecosFX.com.